Part of my New Year's resolutions this year include reading authors I've never read before. 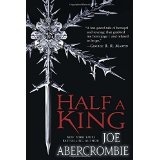 I've never read Joe Abercrombie before, so I picked up Half a King to check it out. The premise: Yarvi is the son of the king, born with one good hand, and thus considered less than nothing by his father and brother. But no worries, he's not the heir, so he's training to be a minister. Except suddenly both his father and brother are killed and he's next in line. All of his hopes as a minister are dashed and he ascends to the throne and immediately vows revenge. But as he leads his forces on the warpath--under the banner of his uncle, because of his age and his crippled hand--he's betrayed and finds himself sold into slavery. Now Yarvi has to survive slavery, the harsh northern winter wastelands, and somehow fight his way back to his own lands, his own castle, and retake his throne . . . even though he never wanted to rule. I enjoyed the book. It's, at heart, a simple tale and Yarvi is a very relatable, pragmatic main character. You root for him immediately because of the horrible cards he's been dealt. But he's not stupid and he uses the knowledge he's obtained by training to be a minister effectively. He's a likable character, and the men he befriends as he's taken from king to slave to escapee are also extremely likeable and realistic. The world and setting are probably the best aspects of the book. It's pseudo-Viking, which isn't used often enough in fantasy novels. The tone is warlike and vicious and the weak are ridiculed--a perfect place for "half a man" to become king, right? A perfect place for Yarvi to be underestimated anyway. There are hints that this is a post-apocalyptic world, with mysterious "elves" referred to, with what appear to be radioactive areas scattered here and there, strange metals, etc. So intriguing possibilities that aren't used in this novel (except possibly the Screaming Gate), but may be used in sequels. The plot itself is . . . basic. Very straightforward, with few twists except one or two toward the end. For those that like the epic fantasy novels, with multiple POV characters and many plot threads and twists and turns (like me), the book may be too simple. I did, and it was only the smooth writing, interesting world, and the characters that drew me in and kept me reading. But even with the simple plot, I'll likely check out the next book in the series when it comes out.